Everything Mommyhood and a small group have bloggers have come together with a blogger sponsored giveaway for our Facebook Fans! When I need small household items, Target is my go-to. I can always find the essentials when they need to be replaced. Their range in items, competitive prices, and the stylish designs of products are what keep me going back. What do you like about Target? There's no Twitter handles to like, no Pinterest accounts to follow, and no voting for your favorite blog. In this giveaway you only have to like Facebook Pages! Enter below on the Giveaway Tools form to win. Good luck! 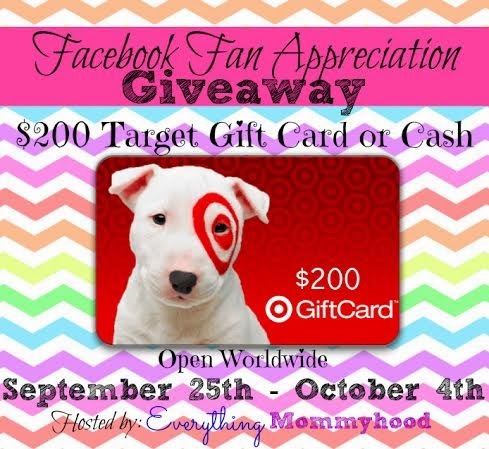 One lucky winner will receive a $200 Target Gift Card or $200 Cash via PayPal. Giveaway is open worldwide, void where prohibited. Excludes Quebec. Must be 18+. If the winner resides outside of the U.S., the winner will receive $200 USD via PayPal. Only one entrant per household, per address. Winner is subject to eligibility verification. Winner will be contacted via email and have 48 hours to respond before a new winner is chosen. Giveaway ends October 4th, 2014 at 11:59pm CST. Disclosure: The participating bloggers were not compensated for this posting. All thoughts and opinions are those of our own and were not influenced in any way. Facebook, Twitter, Pinterest, Google, and any other social media are not affiliated with this posting or giveaway. Everything Mommyhood is responsible for prize fulfillment and shipment. Only one entrant per household, per address may enter. Winner is subject to eligibility verification. Winner will be contacted via email and will have 48 hours to respond. Failure to respond in a timely manner, a new winner will be chosen and you will forfeit your prize. This disclosure is done in accordance with the Federal Trade Commission 10 CFR, Part 255 Guides Concerning the use of Endorsements and Testimonials in Advertising. If you have any questions about this event or would like to see your event hosted by Everything Mommyhood, please email EverythingMommyhood@gmail.com. cash & bills (boring, but helpful) apologies if two comments appear. I would choose cash to fund my baby carrier.